LIC Jeevan Labh Plan is a Non-Linked Limited Premium Paying Endowment Assurance Plan. 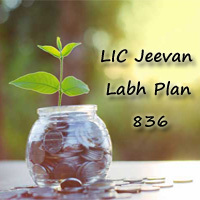 The Jeevan Labh LIC Plan 836 is a combination of investment and insurance. Hence, LIC’s Jeevan Labh Plan is perfect for planning child’s education and marriage. Let’s go through the following sections of this article to know about LIC Jeevan Labh policy details. The LIC Jeevan Labh Policy is an Endowment Plan introduced by Life Insurance Corporation of India on January 01st 2016. The Unique Identification of Jeevan Labh Plan is 512N304V01. On Payment of Additional Premium, LIC Plan 836 provides Optional Benefits such as Accident Death and Disability Benefit Rider, New Term Assurance Rider. The LIC Jeevan Labh Plan is a combination of savings and protection. There are three Policy Terms in this LIC New Plan Jeevan Labh. They are 16, 21 and 25 years. Death Benefit and Maturity Benefit are available with vested simple reversionary bonus and final additional bonus. By using the LIC Jeevan Labh Premium Calculator or LIC Jeevan Labh Endowment Maturity Calculator the premium rates for the sum assured can be calculated. The Premium Payment is to be for Monthly, Quarterly, Half Yearly and Yearly. The Life Assured can use the loan facility offered in this Plan. The insured can also get the LIC Jeevan Labh Premium Chart in the below sections of this page. LIC Jeevan Labh Policy 836 is an Endowment Plan with Profits and a combination of Protection and Savings. Financial Assistance is provided to the family of Life Assured if dies before the Maturity Period. At the time of Maturity of the Policy, lump sum amount is provided to the Policyholder. The Proposer can avail the LIC’s Accidental Death and Disability Benefit Rider and LIC’s New Term Assurance Rider option on payment of additional premium. For Quarterly, Half Yearly, Yearly mode of premium payment, a grace period of one month but less than 30 days and 15 days for monthly premium payment is provided to the Life Assured. Guaranteed Surender Value and Special Surrender Value are available to the Policyholder on Surrendering the Policy. If you are not satisfied with the Terms and Conditions of the Policy, you have the facility to return your policy before completion of Free-look Period. What are the Benefits of LIC Jeevan Labh Endowment Plan? Death Benefit: The Nominee will receive the Death Benefit from the Corporation if the Policyholders Death occurs during the Policy Term. The Death Benefit should not be less than the 105% of all the premiums paid as on date of death. Sum Assured on Death = 10 Times of Annualised Premium or Absolute Amount assured to be paid on Death, i.e., Basic Sum Assured. Death Benefit = Sum Assured on Death + Vested Simple Reversionary Bonuses + Final Additional Bonus. Maturity Benefit: The Policyholder will receive the Maturity Benefit on the survival of the Life Assured until the end of the Maturity Period. Maturity Benefit is Sum of Basic Sum Assured, along with vested Simple Reversionary Bonuses and Final Additional bonus. Minimum Entry Age 8 years (completed). For 16 years Policy Term: 59 years. 21 years Policy Term: 54 years. For 25 years Policy Term: 50 years. Policy Term 16, 21, 25 years. Premium Paying Term 10, 15, 16 years. Maximum Maturity Age 75 years (nearest birthday). Minimum Sum Assured Rs 2,00,000/-. Maximum Sum Assured No Limit. Premium Payment Mode Yearly, Half Yearly, Quarterly, Monthly (ECS or SSS). LIC of India offers a Special LIC’s Accidental Death and Disability Benefit Rider (UIN: 512B209V01) and LIC’s New Term Assurance Rider (UIN: 512B210V01) under the Jeevan Labh Endowment Plan 836. LIC’s Accidental Death and Disability Benefit Rider: This rider is available to opt within the premium paying term by the Policyholder. If Sudden Death occurs to the Life Assured, the Nominee will receive the Accident Benefit Sum Assured. On Disability of the Proposer due to the accident, the Accident Benefit Sum Assured is paid for a period of 10 years and all future premiums of Basic Plan which is equal to the Accident Benefit Sum Assured will be waived off. The Life Assured should meet the below eligibility conditions for this rider. Maximum Entry Age 65 years (nearest birthday). Maximum Cover Ceasing Age 70 years (nearest birthday). Minimum Accident Benefit Sum Assured Rs 10,000/-. Maximum Accident Benefit Sum Assured An amount equal to Basic Sum Assured subject to a maximum of Rs 100 lakh overall limit. LIC’s New Term Assurance Rider: On Death of the Life Assured during the Policy term, the Nominee will receive the Term Assurance Rider Sum Assured if opted for this rider. An additional Premium need to be paid along with the Basic Plan during the Premium Paying Term. Policy Term Same as Base Plan. Premium Paying Term Same as Base Plan. Minimum Term Assurance Rider Sum Assured Rs 100,000/-. Maximum Term Assurance Rider Sum Assured Should be less than or equal to the Basic Sum Assured under the Base Plan. Life Insurance Corporation of India provides rebates to the Policyholders under this LIC Endowment Plan 836. Rebate means getting a discount on tabular premium as per the payment mode of the policy. The Different Rebates available in this LIC Jeevan Labh Endowment Plan are available below. Monthly and Quarterly Mode NIL. Half Yearly Mode 1% of the tabular premium. Yearly Mode 2% of the tabular premium. Rs. 2,00,000/- to Rs. 4,90,000/- NIL. Rs. 5,00,000/- to Rs. 9,90,000/- 1.25% of BSA. Rs. 10,00,000/- to Rs. 14,90,000/- 1.50% of BSA. The LIC Jeevan Labh Endowment Plan is available for purchase through online at LIC official website, i.e., www.licindia.in or from LIC Branch nearest to you or from the LIC Agent. The Necessary Documents to buy the LIC Jeevan Labh Plan 836 are listed below. Proposal Form/Application Form with a photo. By using the LIC Jeevan Labh Calculator, you can calculate the minimum premium that has to be paid to take the Policy. The Amount of Premium Paid will depend on the Sum Assured, Policy Term, Premium Payment Modes and Age of the Life Assured. The insured can calculate the maturity amount using the LIC Jeevan Labh Maturity Calculator. For in force /Fully Paid-up policies: 90%. Policy Revival: LIC Jeevan Labh Plan can be revived within two years from the date of First Unpaid Premium (FUP). The insured can surrender the LIC Jeevan Labh Policy any time during the Policy Tenure after Successful Payment of Premium for three successful years. The Policyholder will receive Guaranteed Surrender Value and Special Surrender Value on Surrendering of the Policy. Guaranteed Surrender Value: The GSV is equal to the total premiums paid (excluding taxes, extra premium and rider premium, if any) along with the Surrender Value of Simple Reversionary Bonuses which is equal to Vested Bonuses multiplied by the Guaranteed Surrender Value factor applicable to vested Bonuses, will be Payable. Special Surrender Value: The SSV is the discounted value of the sum of Maturity Sum Assured and Vested Simple Reversionary Bonuses if any will be payable. Paid-up Value: If the Policyholder has paid premiums for at least two years or three full years depends on the Premium Paying Term and any Subsequent Premiums be not paid, all the Benefits under this policy will be ceased after Grace Period has completed. [(Number of premiums paid/ Total Number of premiums payable under the Policy) x Sum Assured on Death]. Free Look (Cooling Off) Period: If the Policy Holder is not satisfied with the Terms and Conditions of the Policy, Policyholder can return the Policy within 15 Days from the date of receipt of the Policy Bond. Back-Dating Interest: The Policies can be Dated back within the Same Financial year. The Corporation will charge the Rate of Back-dating Interest from time to time of completion of policy. What are the Premium Payment modes available in this Jeevan Labh Plan? Ans. The Life Assured can pay the premium in Monthly, Quarterly, Half Yearly and Yearly Modes. 2. What are the Riders available under this Plan? Ans: LIC’s Accidental Death and Disability Benefit Rider and LIC’s New Term Assurance Rider are available under LIC Jeevan Labh Plan. 3. What is Grace Period for the LIC Jeevan Labh Plan? Ans: A Grace Period of one month is available for Yearly, Half-Yearly, and Quarterly Payments, 15 days for Monthly Premium Payments. 4. Can I Revive the LIC Jeevan Labh Policy? Ans: Yes, you can revive your lapsed LIC Jeevan Labh Plan within two years from the date of First Unpaid Premium.